This was a delicious new meal for us! My mom discovered the Tracey’s Culinary Adventures blog several months ago and since then she has tried some of her recipes. When she loves them she passes them on to us. Tracey also happens to be a local blogger so I enjoy sharing her blog with others. Today’s recipes is one of those that my parents tried and loved, and sure enough we loved it too. Don did the same thing when he cooked our meal and it was wonderful. 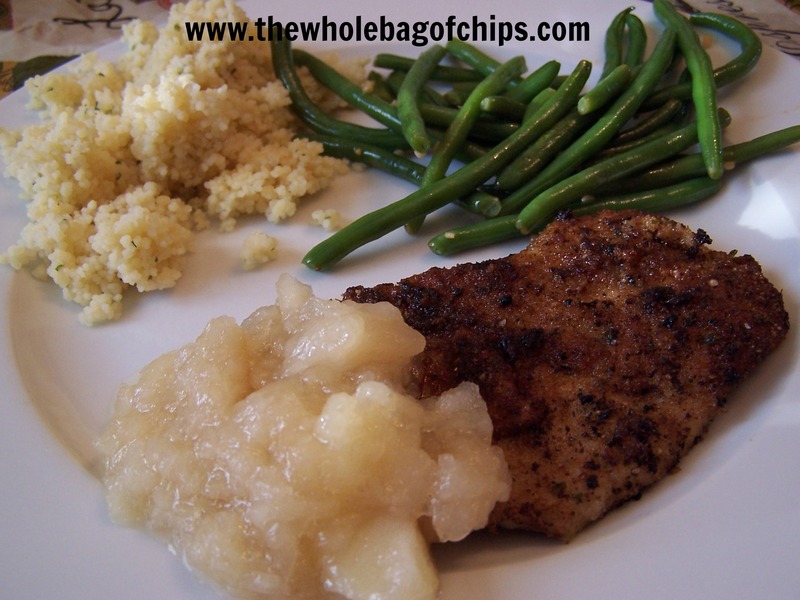 I served this with couscous, homemade applesauce, and sauteed green beans. I’d definitely make it again. We actually purchased thin cut pork chops from Aldi’s so we didn’t need to pound ours at all. Tracey’s blog is full of great recipes and I encourage you to check it out! Using a meat mallet (or whatever you have – a skillet or rolling pin would be fine), pound each of the pork chops until they are 1/8-inch thick. In a wide, shallow dish, beat the milk and egg with a fork until combined. In a second dish, stir together the breadcrumbs, parsley, garlic powder, and pepper. Season the pork chops on both sides with the salt. Dip in the egg mixture, coating both sides and letting the excess drip off, then transfer to the breadcrumb mixture, covering each side with an even layer. Set a large nonstick skillet over medium-high heat. Add 1 tablespoon of the oil and heat until shimmering. Place two of the pork chops in the pan and cook for about 2 minutes on each side, or until the coating is golden brown and the pork is cooked to your desired doneness. Transfer the pork to a plate and tent to keep warm. Repeat with the remaining tablespoon of oil and the remaining two pork chops.